The Nissan DataScan II for Windows is intended for newer Nissan cars equipped with gray 16 pin OBDII connecter and use Consult II protocol over K line (DDL2) up to year 2007. The connector is usually located near the fuse box. A list of cars that the software has been tested on is located on the Supported Vehicles page. The list is by no means comprehensive and is constantly being updated as new vehicles are tested. NOTE: NOT COMPATIBLE with 2008+ cars that use the CAN BUS protocol. Some vehicles up to year 2004 use OBDII (K-Line) for communicating with the ECU, BUT still use the Consult I (14pin) port for diagnostics. The software can be used with our FTDI FT232RL based OBD Innovations® OBDII KKL Adapter Cable. The ELM327 chip based adapters are NOT compatible. The Nissan DataScan II software supports factory Nissan ECUs. Aftermarket ECUs like Apexi Power FC or F-Con V Pro are not compatible with the software. The latest software release supports diagnostics of following control modules: ECM, BCM, TCM, ABS, SRS and ECMD (ECM Diesel) over the K line (DDL2). Note: Some vehicles may use K line for diagnostics of engine ECU (ECM) but still use DDL1 line for diagnostics of other control modules. This software does not support diagnostics over the DDL1 line. 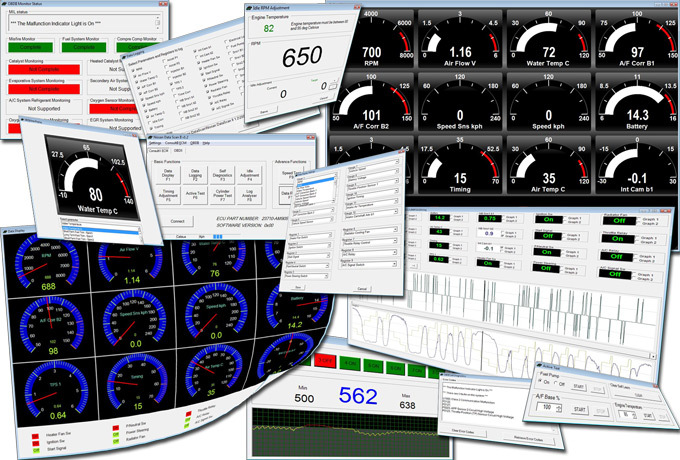 Data Display window uses 12 gauges and 9 registers to display a real time information about the engine as measured or calculated by the engine ECU. Parameters are assigned to gauges in theData Display Settings window. The ECMD tab shows the Diesel ECM Nissan Identification part number. Basic Functions can be selected by clicking on the buttons or using the Menu bar. Most functions except Data Replayand Log Analyser are disabled until communication with the ECU is successfully established. Download Microsoft .Net Framework Version 3.5 SP1: dotnetfx35setup.zip - requires connection to internet to complete installation.